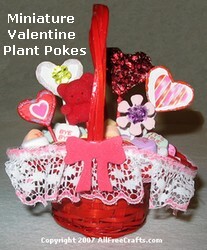 These tiny Valentine plant pokes are easy and inexpensive to make. Just make one as an addition to a small bouquet or make enough, as we did, to fill a small basket for your Valentine. 1. Paint wooden hearts and toothpicks in the base color of your choice and let dry completely. 2. Glue toothpicks to the bottom of the wooden hearts or fun foam flower shapes. Let glue dry completely. 3. Apply heart-shaped stickers, faux jewels or buttons. 4. Outline with dimensional paint or embellish with glue and glitter. 5. Optional: paint the small basket in traditional Valentine colors – red, white, or pink. 6. Cut a small amount of florist’s foam (sometimes called oasis) to fit the bottom of the basket. 7. Insert miniature plant pokes into the foam. 8. Cover foam with Valentine candies or shredded Valentine grass. — Use a small terra cotta pot instead of a basket. — Cut small heart shapes from poster board or cardboard and glue two together, with the toothpick stem inserted in between the layers. Use in place of the wooden hearts. — Use lollipop sticks or cut down bamboo skewers to use instead of toothpicks for longer plant pokes. — Decorate the container with lace and glue on more decorated wooden hearts or fun foam shapes.